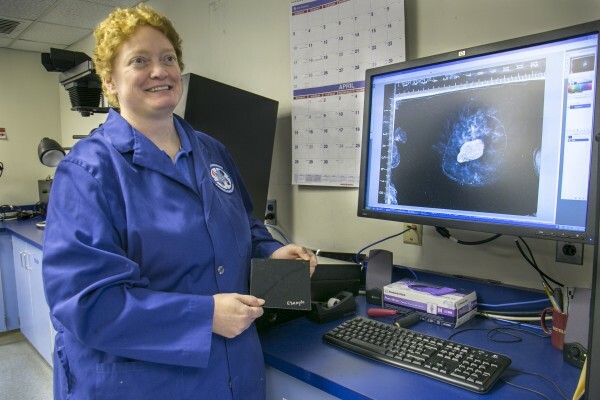 Forensic scientist Cindy Homer displays a fingerprint sample imaged using the print gel scanner at the Maine State Police crime lab in Augusta. The scanner has a resolution of between 150 and 180 megapixels, allowing prints to be examined even from extremely difficult impressions, like from human flesh. Maine chief medical examiner Margaret Greenwald shows a tray of tissue samples at her lab in Augusta on April 4, 2013. 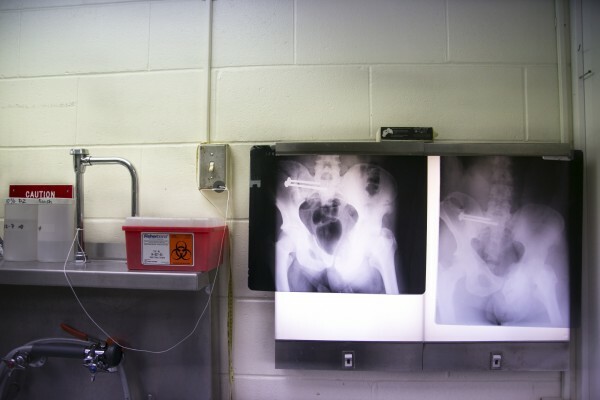 X-ray hang on display at the Maine chief medical examiners office in Augusta on April 4, 2013. Maine chief medical examiner Margaret Greenwald said they requested the x-rays to help identify a possible missing person in another state after she noticed a scar on the hip indicating a possible hip surgery. 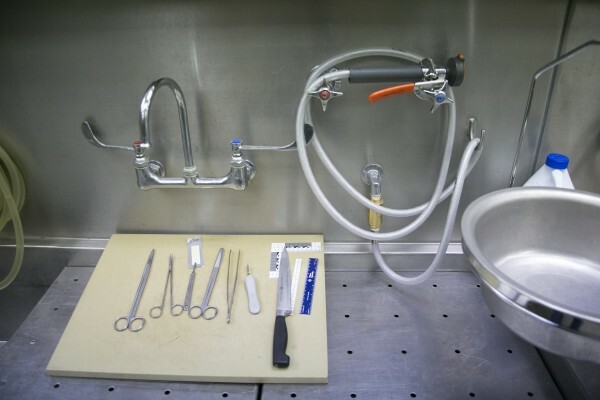 The autopsy room at the maine medical examiner's office in Augusta on April 4, 2013. 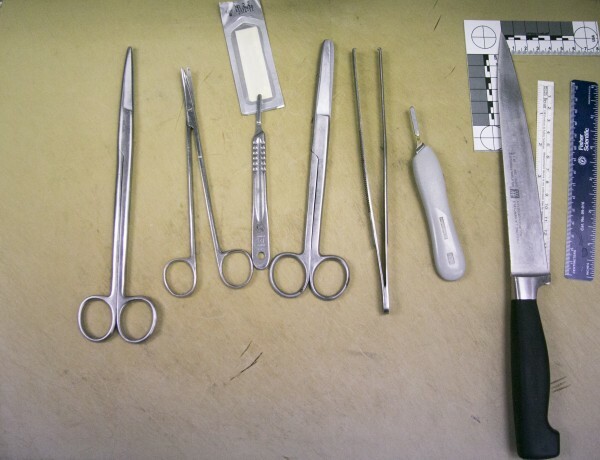 Tools used for autopsies at the chief medical examiner's office on April 4, 2013. The tools had been cleaned from an autopsy conducted that morning, said chief medical examiner Margaret Greenwald. GLENBURN Maine — A combination of old school detective techniques paired with the latest in DNA profiling and quick computer analysis of social media sites and cell phones led investigators to the man they believe killed 15-year-old Nichole Cable in less than a week. The Cable case is a prime example of how state and local agencies work together to solve major crimes in Maine. It’s a system developed to cover a large geographic area with limited financial resources. “Nobody has it all,” Deputy Chief Troy Morton of the Penobscot County Sheriff’s Office said in reference to the resources and specially trained personnel needed to solve major crimes. Challenges abound, such as keeping up with the latest crime lab techniques and computer technologies — including social media and mobile communication devices — that were nonexistent just a few years ago. Stokes also said that the state’s attorney general’s office, which prosecutes all homicides in Maine, often deal with the “‘CSI’ effect” in which juries and the public expect quick, dramatic case-solving like that seen on the popular TV series. Shows such as “CSI” have facets of truth, but do not illustrate all the hard work that goes into each step of each case. It takes time for detectives to do their job, Morton and other in law enforcement have said. “In reality, evidence collection and analysis can be a very long, tedious and difficult task,” it states. Nichole Cable’s friends and parents say that she was tethered to her cellphone and lured away from her home by Facebook posts Kyle Dube made under a fake name, state police Detective Thomas Pickering said in the affidavit filed in Dube’s arrest. Dube, 20, of Orono was charged with her murder last week and indicted by the Penobscot County grand jury on Wednesday for murder and kidnapping. If convicted of murder, Dube faces between 25 years and life in prison. When the 15-year-old girl from Glenburn went missing on Mother’s Day, law enforcement officers from all over the region — county, municipal, state and even federal — converged in Bangor and worked as partners to solve the case that soon turned into a homicide investigation. “This is not how we wanted it to end,” Penobscot County Sheriff Glenn Ross said on the day it was announced that Cable was deceased. The county took the missing girl report and collected physical evidence from the scene; Bangor police detectives tracked Cable’s Facebook usage and helped link it to Dube; Maine State Police major crimes unit interviewed Dube, his girlfriend and his brother; the medical examiner went to the scene where Cable’s body was found and conducted an autopsy; and the Maine State Police Crime Laboratory was able to link the fake Facebook account to Dube’s cellphone and match clothing found near Cable’s home to her and Dube using DNA. The public also assisted when more than 500 showed up a week after Cable went missing to search for her in the woods and bogs of her hometown. Now, the final partner — Maine’s attorney general’s office — has the job of prosecuting the case. When local police discovered Cable had been communicating with a fake Facebook page and needed additional computer assistance, the Maine State Police were called in to assist, the court documents say. State Police Detective Laurie Northrup, who works for the crime lab, was able to link the fake Facebook page to Dube, because he was logging onto both accounts using his cell phone, she discovered. State Police Detective Jennifer Fiske then interviewed Dube’s girlfriend, and Detective Jay Pelletier interviewed his brother and both got statements that linked Dube to the death of Cable and the location of her body. He threw Cable’s clothes out the window as he drove back to pick her up, the girlfriend said. “Kyle intended to kidnap Nichole and hide her; that he would find her and be the hero,” Dube’s brother told Pelletier. After collecting the interviews, the area described was searched, and a game warden and his dog found Cable’s body late on May 20 covered with sticks near Gilman Falls in Old Town. Meanwhile, forensic evidence had been collected. Penobscot County Detective Bill Flagg located a blue hat with a hole cut in it, a black sneaker and a sock near Cable’s home the day after she went missing. He sent the items to the crime lab and forensic scientist determined that DNA found on that evidence linked Dube and Cable, Pickering said in the court affidavit. Yet, not all cases are so straightforward. The forensic evidence collected can sometimes be so small, it is not visible. That is why, when a homicide or other major crime occurs in Maine, local officers call in the experts. “We call our CSI folks the evidence response team,” Harwood said, while seated behind his desk inside the nondescript two-story brick building in Augusta that houses the crime lab. There are about 30 Maine State Police investigators and officers from Bangor and Portland who are trained in major crime scene investigating. The team also has 20 associate members with a wide variety of forensic expertise who act as consultants. “Members are trained as generalists — they need to possess a working knowledge of all the various disciplines of forensic science,” State police Detective Herbert Leighton, a founding member of the unit, said when he testified at the trial of Peter Robinson in March. Some team members are specialists in ballistics, footprints and fingerprinting, biology and capturing trace evidence. There are around 2,200 deaths reported annually in Maine, and about 1,200 of those become medical examiner cases, Dr. Margaret Greenwald, Maine’s chief medical examiner, said recently. “We do autopsies on about 350 of them,” she said. Deaths that are suspicious, involve possible medical neglect or malpractice, are from unknown causes, involve children, those in custody or under the care of a religious practitioner require an autopsy, she said. Being at the scene is crucial in solving crimes, said Greenwald, who has been a medical examiner since 1985, the last 16 years in Maine. “Sometimes we can be helpful to police, and it’s always helpful for us to see the people at the place of death,” she said. Dustin Dube told investigators that his brother told him he hid in the woods wearing a ski mask and jumped Cable when she made her way to the end of her dirt driveway, hoping to get some marijuana from her Facebook friend. Kyle Dube used duct tape to wrap up the girl, who only weighed about 90 pounds, and the he put her in his father’s truck, his brother said. When he stopped to get Cable out of the truck, she was dead, the affidavit states. Kyle Dube then drove to Gilman Falls and dumped the teenager’s body near the Stillwater River. Eight days later, the medical examiner’s van pulled down the road leading to the dam and removed the girl’s body. Her autopsy was conducted in Augusta. 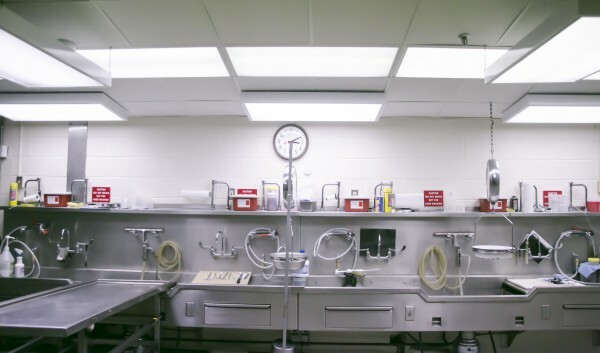 A glass wall was added to the basement autopsy room years ago, so police involved in any case can watch and ask questions without having to completely suit up, and unlike “CSI,” the room is brightly lit, the medical examiner said. Whenever there is a homicide in Maine, it is the medical examiner’s office that officially releases the person’s name, and the manner and cause of his or her death. The medical examiner deemed Cable’s death a homicide but is awaiting test results to determine how she died, Stokes said last week. 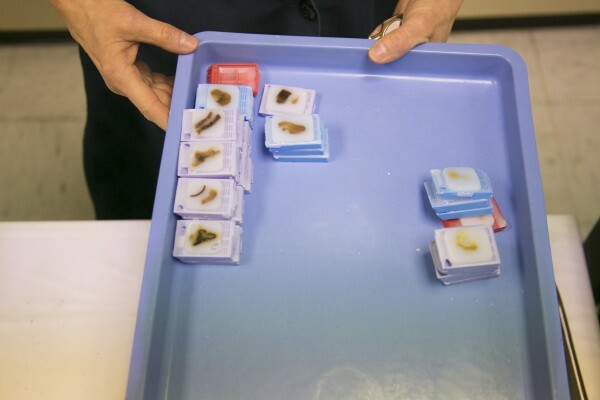 Once evidence is collected, it goes to Maine’s crime lab which creates DNA profiles, runs sexual assault tests, fire debris analysis, fingerprint and tire track comparisons, weapons examinations, evidence comparisons and other tests. The lab contracts out for handwriting, blood-alcohol, toxicology and mitochondrial DNA tests, and works hand-in-hand with the medical examiner’s office, located next door. The system’s effectiveness was illustrated when forensic scientist Cynthia Homer testified in the 2011 fatal hit-and-run trial of Garrett Cheney, then 23, of South Berwick, who was accused of hitting a University of Maine student and leaving her body in a snowbank. Homer told the jury a broken piece of gray plastic found wrapped up with the victim fit perfectly into a broken section of grille from Cheney’s truck that also crashed in Newport. “Luckily, the tow truck driver picked up the grille and threw it into the back of his truck,” she said while in her laboratory demonstrating a specialized gel pads scanner used for lifting finger and footprints. That piece of plastic proved to be a critical piece of evidence. Cheney was convicted and sentenced to 15 years in prison, with all but seven years suspended, for manslaughter in the death of Jordyn Bakley, 20, of Camden. “In so many cases, forensics make or break the case,” Stokes said. Six cells. That is all that is required to get a DNA sample from a crime scene, according to DNA forensic analyst Cathy MacMillan. Constantly evolving detection techniques have improved to the point where forensic scientists can get DNA from saliva, sweat or just a few skin cells. “Back in the old days you needed a dime-sized sample” but nowadays, profiles can be created from handled items, MacMillan said. The blue hat, sock and sneaker located near Cable’s home were found in a wooded area at the junction of Spruce Lane, a ½-mile long private dirt roadway with only seven residences, and Route 221. The crime lab was able to “determine that Dube’s DNA profile was located on the blue hat” and “both Dube’s DNA profile and Cable’s DNA profile were on the sock,” Pickering said in the affidavit. The truck used by Dube, owned by his father, has been taken as evidence as has computer and electronics taken from his home in Orono, which will all be processed by the crime lab. Chemists in Maine’s DNA lab, established inside the crime lab in 1997, have helped solve hundreds of crimes over the years and they use the Combined DNA index system, or CODIS, to catch others, according to MacMillan. Once a DNA profile is entered, the national database scans all the profiles for a match. “We get at least four hits a month to upwards of 23 hits,” Harwood said. Maine collects DNA from all convicted felons and those convicted of some misdemeanor sexual offenses against children, but some states collect DNA samples at the time of arrest, MacMillan said. “We’ve had over 800 CODIS hits that have led to an investigation,” she said. Many of those involved burglaries, Harwood said. He cited the decade-old cold case of Crystal Perry, a 30-year-old mother brutally raped and killed in her Bridgton home on May 12, 1994, as an example of the working CODIS system. “There was a DNA profile that was obtained from physical evidence left at the scene that was in CODIS for a very long time,” said Harwood, who was a lab chemist at the time. Twelve years later, a CODIS hit identified Bridgton resident Robert Hutchinson, who was arrested for Perry’s murder in 2006 and convicted in 2007. Hutchinson is serving a life sentence. “It was kind of nice to see the fulfilment of that case,” Harwood said. Even though the building says Maine State Police, most crime lab employees are scientists, including Homer and Alison Gingras, a forensic scientist who started as a lab tech in 1985. “Everything is a puzzle, and no two cases are the same,” Gingras said while demonstrating the lab’s new infrared camera that helps visualize dried blood or gunshot residue on dark evidence. The crime lab gets between 800 and 1,000 cases annually and has two federally-funded DNA analysts to work active investigations and keep down backlogs. Up to 10 percent of the crime lab’s funding is federal grants, that are “going down over time,” so maintaining the approximately $3.6 million operating budget for the 21-person lab is a constant worry, Harwood said. Spokesman Stephen McCausland did not have an updated cost figure for the ongoing Reynolds case, which also includes Waterville police, the Wardens’ dive teams, boats and planes, the crime lab and medical examiner’s office. “This is the largest investigation in state police history, and as a result will be the most costly,” he said earlier last month. With Perdomo and Cable, the costs of the entire multi-agency investigation may never be known.